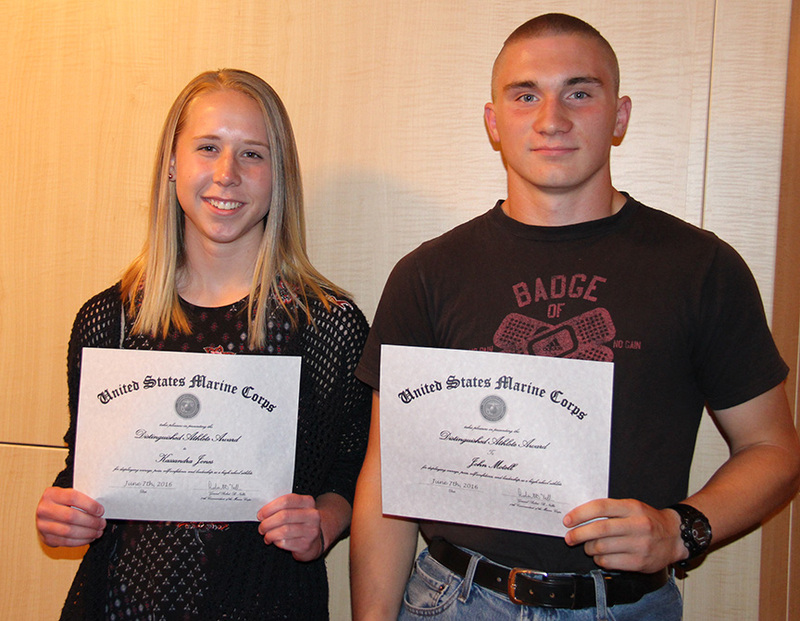 HANNIBAL, NY – Hannibal High School students were recognized for their academic success, leadership and character during an awards night held recently in the Lockwood Auditorium. Seniors Kali Foss and Nathan LaRock receive SUNY Oswego Merit Awards during a year-end ceremony. Graduating seniors earned thousands of dollars in scholarships and other honors for perfect attendance, achievement in specialty subjects, excellence in athletics and scholastic success. High School Principal Stephen Dunn applauded the students’ efforts and praised them for their accomplishments. “Congratulations and thank you for the hard work and discipline that will ultimately lead to achievement and lifelong success,” Dunn said to the award recipients. He noted that the community is an integral part of the students’ success and expressed his gratitude to the area businesses, community members and organizations who helped fund the scholarships. Kassi Jones and John Motell IV accept the U.S. Marine Corps Distinguished Athlete Awards. 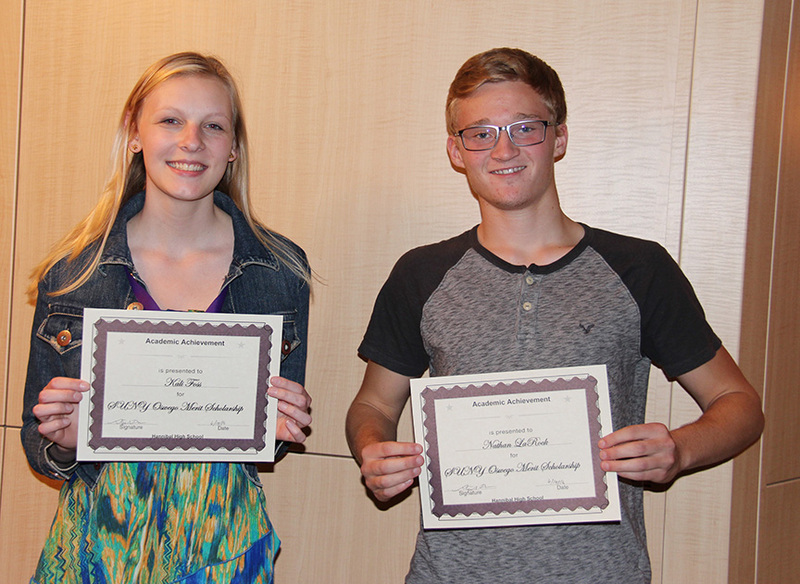 In addition to the locally funded awards, several colleges and universities also offered hefty scholarships – $20,000 and $40,000 awards – to members of the junior class who have displayed leadership, creativity and citizenship. Athletic honors were also presented to the following: Tayler Dence and Megan Norris (Outstanding Senior Athlete Awards); Austin Baker and Sydney Waloven (U.S. Army Reserve National Scholar-Athlete Awards); John Motell IV and Kassandra Jones (U.S. Marine Corps Distinguished Athlete Awards); and Megan Norris and Blake Farnham (U.S. Air Force Athlete of the Year Awards).